Perhaps best known for the quaint, small town feel and award-winning beaches, Cape May is the oldest shore town resort in the country. Located on the Southern tip of New Jersey, the town has become a world renowned destination for beach-goers, history lovers and even bird watchers, who flock to the area every summer. Named after Cornelius Jacobsen Mey, a Dutch captain who claimed the area for the New Netherland province in 1621, Cape May proudly serves as one of America’s first widely recognized summer vacation hot spots. This premiere shore destination--rife with a diverse bird population, Victorian architecture and serene beaches--started to gain popularity in the mid 18th century after being settled by members of the New Haven Colony. In 1878, a devastating fire that burned for five days destroyed much of Cape May’s town center. As part of a robust reconstruction effort, investors and entrepreneurs were able to rebuild the town center, and many of the of Victorian-style homes that still stand there today were built in that effort to restore the town’s well-regarded architectural style. 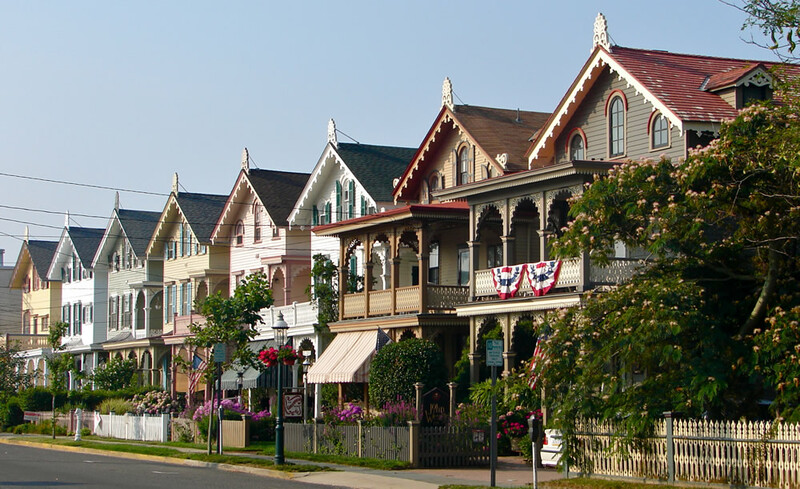 By the 19th century, Cape May was known as America’s most sought after vacation destination, with the cool, ocean breezes providing visitors with some much-needed relief from the hot, stuffy climate of inner city living. While its' legacy as America’s first summer shore spot remains, Cape May now plays host to hundreds of shops, restaurants, inns and historic estates, as well as a number of highly-anticipated yearly events, including the Cape May Jazz Festival, Cape May Music Festival and the Cape May, New Jersey Film Festival. The addition of the beautiful and historic pedestrian Washington Street Mall in 1971 allowed visitors to get a feel for Cape May as it once was, while giving rise to a bustling town center that’s a popular night time destination for visitors. Today, visitors can enjoy some of the best dining New Jersey has to offer, and the unique, historic style of Cape May attracts tourists from all over the world. In 2008, the Travel Channel ranked Cape May as on of America’s top ten beaches, solidifying the town as a tried and true American beach destination.